Can Spider Veins Go Away? Do you find that your skin is crawling with spider veins? Does it make you feel self-conscious about your body? Are you wondering “can spider veins go away”or, at the very least, not be so visible? Spider Veins, scientifically called Telangiectasias, are a small knot of red veins lying just under the skin’s surface. They look just like spider webs, hence the name. Unlike Varicose Veins, they don’t have serious medical consequences, but they can be aesthetically displeasing and may also be a sign of an underlying vein disease. If allowed to spread considerably, they can even cause physical discomfort. But can spider veins go away? Well, there are are a number of vein treatment options you can pursue. You can use a number of DIY home remedies, which we will list out later in this article. While these methods might greatly improve the appearance of spider veins in some circumstances, they usually cannot make spider veins go away entirely. 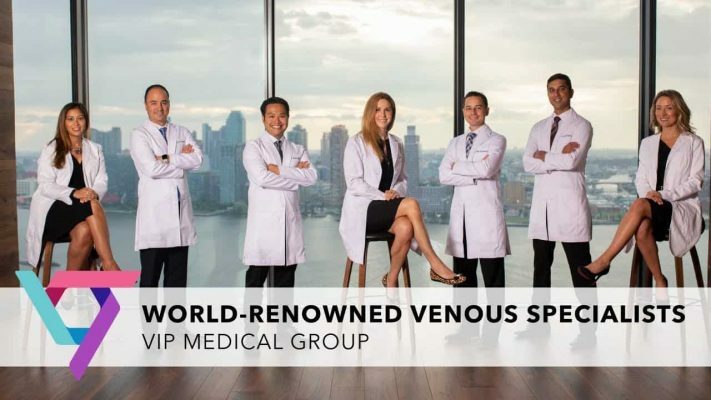 The most effective way to make spider veins disappear is to consult a vein doctor in New York or vein doctor in New Jersey. At Vein Treatment Clinic, we employ the latest spider vein treatment options to drastically minimize the appearance of spider veins. In this article, we’ll tell you what spider veins are, how spider veins occur, and how you can make spider veins go away. Before considering treatment options, you need to first understand what spider veins are. Spider Veins are basically tiny blood vessels prominently visible in the outer layer of the skin. They are located between the dermis and epidermis, i.e., the two upper layers of the skin, they appear red in color, and visually look like branches or spider webs. They are generally formed in the legs or the face. They may be a source of slight discomfort and can even be indicative of a serious vein disease called venous insufficiency. Varicose Veins tend to bulge out of the skin. They are a series of twisted veins that appear rope-like under the surface. They may be blue, red, or skin-colored in appearance. Varicose Veins generally appear in the thighs, back and front of calves, inside of legs, ankles and feet, inner thighs, buttocks, and lower pelvic area. If left untreated, varicose veins can lead to sores, skin ulcers, and even bleeding. How do Spider Veins Occur? The primary cause of spider veins is Venous Insufficiency. Venous Insufficiency is a vein disease where the valves in the veins malfunction. These valves are generally responsible for preventing the blood from falling back down to the feet. As such, if the valves don’t close properly, the blood flow can leak into the lower part of the veins instead of moving towards the heart. As more blood collects around the veins, the walls of the veins weaken, and they grow large enough that you can see them under the skin. Spider veins most commonly occur in the leg because the force of gravity makes the leg veins susceptible to venous reflux, i.e., blood flow in the wrong direction. Women are a lot more likely to develop spider veins than men. In fact, spider veins affect more than 50% of all women. Having a family history of spider veins or varicose veins. Crossing your legs while sitting. Using menopausal hormone therapy or hormonal birth control. History of blood clots in the legs. A job that requires you to sit or stand for long periods of time, such as teaching, nursing, driving, office jobs, etc. In this section of the article, we’ll answer the question you’ve been waiting for: Can Spider Veins Go Away? Fortunately for you, the answer is a resounding YES! Here, at Vein Treatment Clinic, we regularly come across numerous variations of spider veins and varicose veins on a regular basis. As such, if you visit one of our vein treatment clinic locations, our vein doctor can study your symptoms and come up with a vein treatment plan suited for your specific needs. Before visiting a vein doctor, you can also try a number of different DIY home remedies for spider vein treatment. The following are some DIY techniques that you can use either before consulting a vein doctor or to supplement their treatment plan. Compression Stockings: These are stockings that apply pressure on your veins, facilitating greater blood flows. As such, they are ideal for people who find it painful to walk too much or those who are constantly on their feet. They can be purchased from your neighboring drugstore, a clothing store, or from online platforms like Amazon. However, it is highly recommended that you see your local vein doctor so you can be measured and you receive a custom-fitted pair of compression stockings. Exercise: Muscles in the legs help facilitate blood flow. As such, regular exercise that works the legs can minimize the appearance of spider veins. You can consult your vein doctor in NY or vein doctor in NJ to get recommendations on your exercise routine. While the aforementioned DIY spider vein treatments can help alleviate discomfort and mitigate appearance slightly, they cannot completely make spider veins disappear. For that, you’ll have to visit a reputable vein treatment clinic. If you want to completely make spider veins disappear, you need to consult a vein doctor, i.e., a Phlebologist. Historically speaking, spider veins and other vein diseases were often treated with surgery. However, as a result of modern technology and advancements in medicine, vein doctors now rely on minimally invasive technologies as the safer, easier, and more effective alternative. The following are the four most effective spider vein treatments that have consistently delivered great results for our patients. Sclerotherapy: This is a temporary treatment for venous insufficiency that involves a solution called sclerosant being injected into the damaged vein. Radiofrequency Ablation (RFA): A catheter is inserted into the afflicted vein. Radiofrequency is used to emit heat that collapses the veins and the clogged blood is reabsorbed into local tissue. Endovenous Laser Ablation (EVLA): This is a laser therapy that uses laser energy to collapse the afflicted veins from within. VenaSeal: This is a permanent vein treatment solution that involves an adhesive being injected into the affected vein to immediately shut it down. A vein treatment option can only be recommended after careful examination of your specific condition. As such, it is incredibly important to visit your local vein doctor in New York or vein doctor in New Jersey today so they may come up with a treatment plan. Working in conjunction with VIP Medical Group, our vein treatment clinic features a wide range of highly-qualified and certified vein doctors that carefully examine each and every one of their patients to curate a specific vein treatment plan. Our minimally invasive treatments ensure that all our patients leave our clinic completely satisfied. If you have any other questions about your spider veins and their treatment, you can consult our vein doctors today!